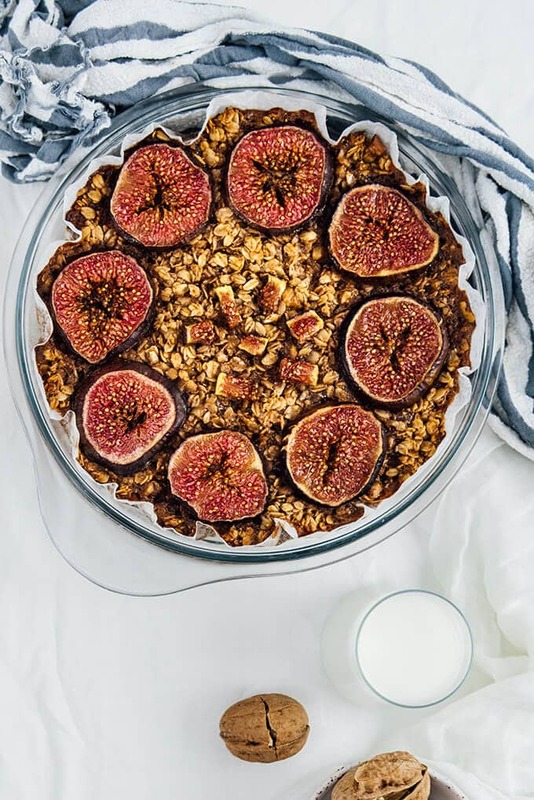 This gluten-free Healthy Baked Oatmeal with Figs makes a super tasty and filling breakfast. Try it with your favorite fruit either in cups or in a pan and enjoy in busy mornings. Have you tried healthy baked oatmeal for breakfast before? It makes a wonderful early morning treat for those who want a quick yet healthy breakfast. This is the first time I’ve made it and I’m sure I will be making it quite often. It is packed with healthy ingredients; walnuts, oats, agave syrup, dried and fresh figs. I loved that chewy texture all these ingredients resulted in! It is ridiculously easy and makes a great healthy on-the-go breakfast. The best thing I love about this recipe is that it is customizable. I use dried figs in the batter because the figs and walnuts are my favorite snacks on their own. Plus, dried figs are perfect natural sweeteners in this recipe. You can make a combination of pecans and dates if you like. Did I tell you that this healthy baked oatmeal recipe is refined sugar-free? In addition to dried figs, agave syrup is used as the sweetener. As for topping, slices of fresh figs work perfectly on it. Don’t you think they look so tempting? To be honest, I find fresh figs ten times more tempting than any chocolate treat. If you don’t have fresh figs on hand when you decide to make this recipe or if they are not in the season then, you can use any fruit you like. For example, pears, apples, peaches or berries would be awesome on and in this baked oatmeal. 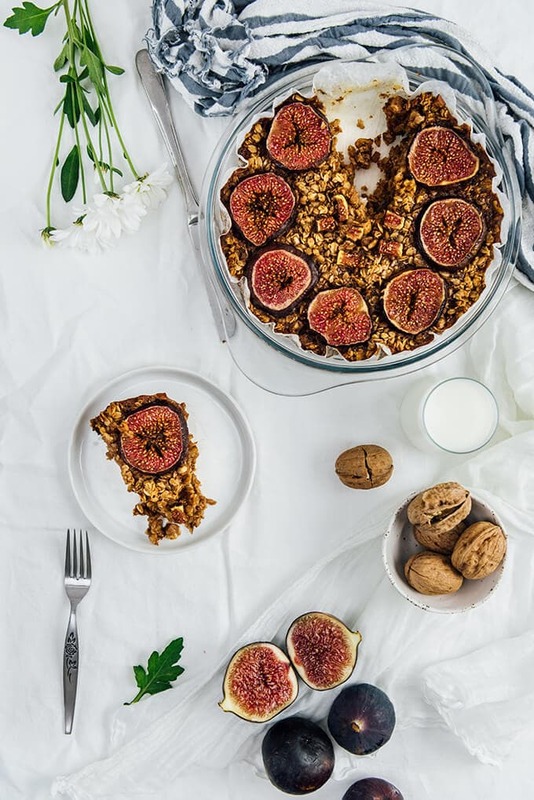 If you like chewy oatmeal cookies like our Chewy Oatmeal Raisin Cookies, this Healthy Baked Oatmeal with Figs recipe is perfect for you. It’s like you have a huge oatmeal cookie on your plate in the form of a slice of pie. You can’t believe how easy it is to make this recipe. 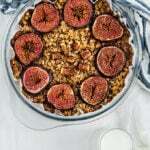 Just combine all ingredients except fresh figs, transfer it into a pan, place fig slices on it and bake until the edges set and figs have a nice bright color. You can even make it in the morning if you are an early bird. No family member can resist the amazing smell coming from the kitchen. Believe me, it is way better than any alarm clock. If you don’t have time to prepare Crepes with Mascarpone Cream and Balsamic Strawberries for an awesome breakfast, bookmark it for the weekend and try this super easy recipe. To have everything ready in the morning, you can bake it overnight and keep it at room temperature until morning. Keep the leftovers in the refrigerator, but I suggest that you remove it from the refrigerator at least half an hour before you eat. I used 2 tablespoons of agave syrup and the final result tastes sweet enough to me. You can always drizzle extra on the finished product if it’s not sweet enough for you. You can use maple syrup in place of agave if that’s what you have on hand. If you’d rather use regular sugar, use brown sugar as it helps the chewiness. To make it vegan, use coconut oil, non-dairy milk and flax eggs. Use a non-stick muffin tin to make it in cups. This is a freezer friendly recipe. You can double the recipe and bake in two pans so that you can store one in the freezer. Just thaw it out as you need a quick healthy breakfast or snack. Optionally, you can serve it with Greek yogurt. A super easy and quick breakfast recipe with oats, walnuts and figs. Preheat oven to 350F. Line a deep pie pan or a 8-inch square pan with parchment paper. In a large bowl, combine everything except fresh figs in the order you see them in the ingredient list. Transfer the mixture into the prepared pan and bake for 25-30 minutes or until the edges set. Made this morning exactly as recipe listed. Was a bit worried as had no sugar but OH MY is is good!! I did just for fun add a tiny dollop of plain greek yogurt and a tiny drizzle of honey. This was a WOWZER!!!!! Thank you! I’ve not seen your blog before but now I will follow!! Hi Cindy! I’m so glad to hear that you loved this easy yet tasty and healthy snack. One of my favorites. Bet it tastes so good with greek yogurt! I hope you enjoy my other recipes as much as this one.